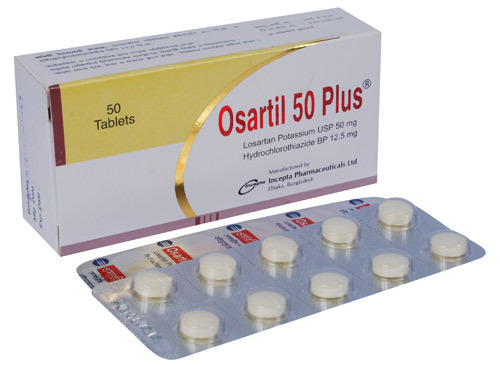 Osartil 50 Plus: Each tablet contains Losartan Potassium USP 50 mg and Hydrochlorothiazide BP 12.5 mg.
Osartil 100 Plus: Each tablet contains Losartan Potassium USP 100 mg and Hydrochlorothiazide BP 25 mg.
Angiotensin II [formed from angiotensin I in a reaction catalyzed by angiotensin converting enzyme (ACE), is a potent vasoconstrictor, the primary vasoactive hormone of the renin-angiotensin system and an important component in the pathophysiology of hypertension. It also stimulates aldosterone secretion by the adrenal cortex. Losartan and its principal active metabolite block the vasoconstrictor and aldosterone-secreting effects of angiotensin II by selectively blocking the binding of angiotensin II to the AT1 receptor found in many tissues, (e.g. vascular smooth muscle, adrenal gland). In vitro binding studies indicate that losartan is a reversible, competitive inhibitor of the AT1 receptor. Neither Losartan nor its active metabolite inhibits ACE (kinase II, the enzyme that converts angiotensin I to angiotensin II and degrades bradykinin); nor do they bind to or block other hormone receptors or ion channels known to be important in cardiovascular regulation. Hydrochlorothiazide is a thiazide diuretic. Thiazides affect the renal tubular mechanisms of electrolyte reabsorption, directly increasing excretion of sodium and chloride in approximately equivalent amounts. Indirectly, the diuretic action of Hydrochlorothiazide reduces plasma volume, with consequent increases in plasma renin activity, increases in aldosterone secretion, increases in urinary potassium loss, and decreases in serum potassium. The renin-aldosterone link is mediated by angiotensin II, so co-administration of an angiotensin II receptor antagonist tends to reverse the potassium loss associated with these diuretics. Osartil Plus is indicated for the treatment of hypertension. It is also indicated to reduce the risk of stroke in patients with hypertension and left ventricular hypertrophy. The usual starting dose of Osartil 50 Plus is one tablet once daily. 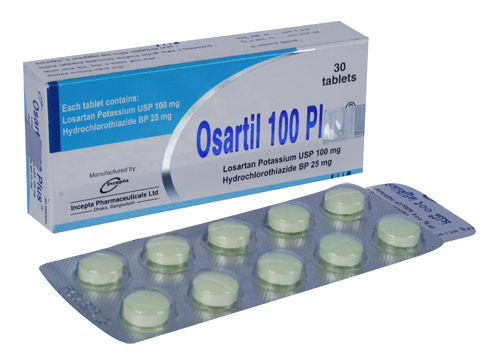 For patients who do not respond adequately to one tablet the dosage may be increased to Osartil 100 Plus once daily. A patient whose blood pressure is not adequately controlled with Losartan 100 mg monotherapy may be switched to Osartil 100 Plus once daily. In hypertensive patients with left ventricular hypertrophy initial dose is Osartil 50 Plus, if additional blood pressure reduction is needed, Osartil 100 Plus may be given. The maximum dose is Osartil 100 Plus once daily. In general, the antihypertensive effect is attained within three weeks after initiation of therapy. No initial dosage adjustment of Osartil 50 Plus is necessary for elderly patients. But maximum dose of Osartil 100 Plus once daily dose should not be used as initial therapy in elderly patients. Use in Patients with Renal Impairment: The usual regimens of therapy with Osartil 50 Plus may be followed as long as the patient's creatinine clearance is >30 ml/min. In patients with more severe renal impairment, loop diuretics are preferred to thiazides. In that case, hydrochlorothiazide is not recommended. Use in patients with Hepatic Impairment: The combination of Losartan and Hydrochlorothiazide is not recommended for titration in patients with hepatic impairment because the appropriate 25 mg starting dose of Losartan cannot be given. The starting dose for initial treatment of severe hypertension is one tablet of Osartil 50 Plus once daily. For patients who do not respond adequately to this dose after 2 to 4 weeks of therapy, the dosage may be increased to Osartil 100 Plus once daily. The maximum dose is one tablet of Osartil 100 Plus once daily. Osartil Plus may be administered with other antihypertensive agents. Osartil Plus may be administered with or without food. Generally this product is well tolerated. However, few side effects including abdominal pain, swelling, back pain, dizziness, rash and cough may occur in rare cases.